Serious Power, No Fumes Portable power for phones to fridges and everything in between. Built-in pure-sine wave inverter. Scalable Power Chainable with other Goal Zero Yeti 1250s and 12V batteries for long-lasting power and extended runtimes. No Gas Required Safe for use indoors and out. Refuel from wall or sun – solar panels sold separately. INPUTS: Charging Ports: 16-48V, up to 10A (160W max) Power Pole Charging Port: 16-48V, up to 20A (240W max) OUTPUTS: 3x 110V AC Unit Inverter: 110VAC 60Hz, 10A (1200W continuous, 1500W surge max) 12V Car Port: 12V, up to 10A (120W max) 2x 6mm 12V Ports: 12V, up to 10A (72W max) 12V Power Pole Port: 12V, up to 33A (400W max) Power Pole Chaining Port: 12V, up to 180A (2100W max) 3x USB Ports: 5V, up to 2.1A (10.5W max), regulated Pure Sine Wave GENERAL: Weight: 103 lbs (46.7 kg), Chainable Dimensions: 11 x 16 x 14.5 in (27.9 x 40.6 x 36.8 cm) BATTERY: Cell Chemistry: AGM Lead Acid Pack Capacity: 1200Wh (12V, 100Ah) #31901 YETI® 1250 SOLAR GENERATOR CHARGE TIME Wall charger (72W) 18 hours Boulder Briefcase 24 hours 2x Boulder 100 12 hours WHAT IT POWERS: LAPTOP 20+ RECHARGES TV 12 HOURS FRIDGE 12-24 HOURS* * Full-size refrigerator runtimes from the Goal Zero Yeti 1250 are dependent on several factors, including the year, make and model of your refrigerator, as well as its volume, fullness and usage. We actively test a variety of refrigerators to determine an average runtime. 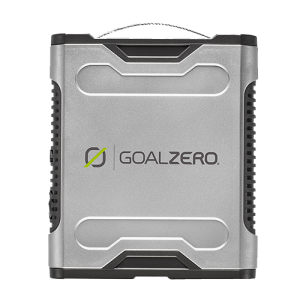 For the longest runtimes and to optimize performance, we suggest limiting the opening and closing of refrigerator doors when powering from the Goal Zero Yeti 1250.